The government has announced what it describes as radical plans to cut our emissions. The measures are designed, ministers say, to allow communities to "walk the walk" when it comes to reducing their carbon footprint. 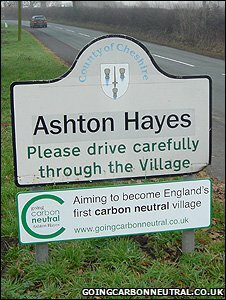 One community that is trying to become the first zero carbon village in England is Ashton Hayes, Cheshire. It's the sort of attractive village you will find on the outskirts of many large urban areas; some local employment, many commuters (in this instance into Chester, Manchester or Liverpool), a pub, a school and a shop. But look more closely and you will see solar panels, wind turbines and other renewable and low carbon technologies. "It's something that has brought the whole community together," says Garry Charnock, one of the organisers of the low carbon community project. He was inspired to start it after hearing the government's former chief scientific adviser, Sir David King, at a literary festival in 2005 talking about the need for action on climate change. "I came away wondering how I could make a difference", he says, "and I realised that the little things - switching off lights, turning down your thermostat - that sort of thing - could make a big change overall if you did it at a community level." Garry teamed up with Roy Alexander, who's not only another villager, but also professor of environmental sustainability at the University of Chester. And Roy, with his activist's as well as his academic's hats on, took up the idea. Now, Garry and Roy believe Ashton Hayes is one of the few projects of its kind in the country to have been independently assessed. "We have managed to reduce household carbon emissions in the village by 23%", Roy says. 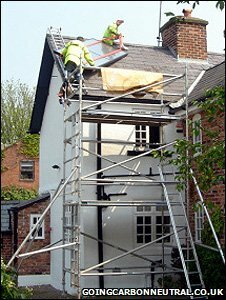 "Initially, there was some scepticism, for example the local publican, but once we had shown him he could save £250 a month on his energy bills by doing things like not keeping the cooker running in the morning, or switching off the beer cooler when it was freezing outside in the winter, we got another convert." Many people say that the project has had benefits way beyond carbon reduction, such as the community spirit that has been generated. "I've lived in the village for 25 years, and I've met people I've never met before as a result of the project," says Lynn May, a local businesswoman. And one success has led to another. 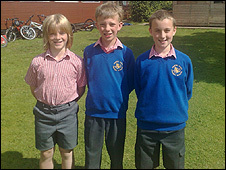 The village successfully lobbied the local authority for a footpath to link the school, other communities and the railways station, allowing people to cycle or walk instead of taking the car. The Ashton Hayes team are now talking to other communities around the country and around the world about their model. They say they are proof that reducing carbon emissions brings many more benefits than a lower carbon footprint.